Getting dressed did not happen today. I decided to spend the morning drinking cup after cup of boiling hot apple juice (yes, delicious), resting and using my metal powers to make my cold go away. I did plan on getting dressed eventually, but when 4 p.m. came and went and I was still pajama clad I thought I might just plan out tomorrows (or maybe Sundays) outfit instead and extend the style challenge a day. The unworn item to be remixed is a black pencil skirt I got a H&M over the summer and have only worn once before, sometime in September. I came up with three choices, and thought it might be fun to let you decide which I should wear! 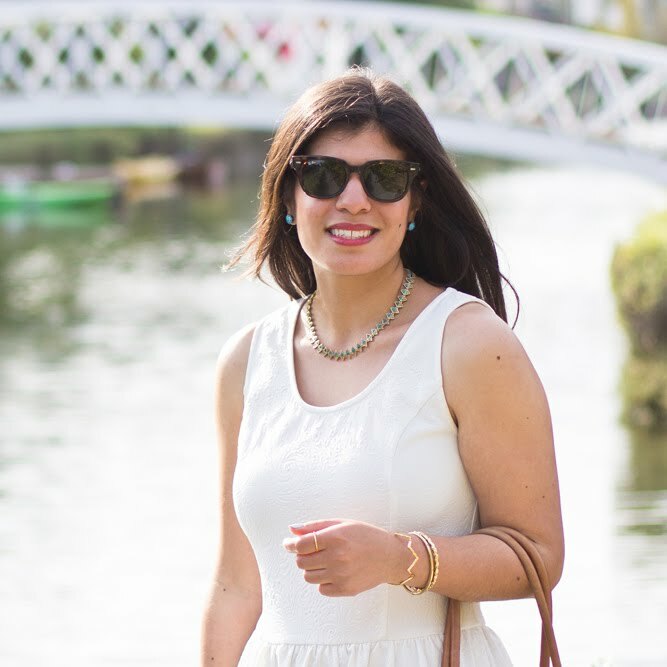 Option One features the white ruffled top from the other day and a bright green snake print cardigan. 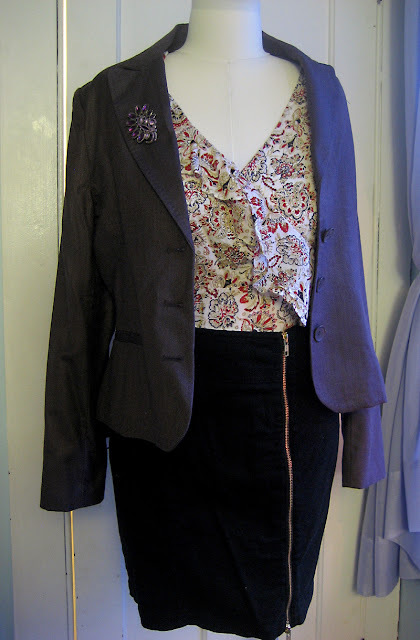 Option Two features (another) ruffled top, but this one is a purple jersey and has been paired with a grey wrap. Option Three features a floral top (with more ruffles - where is my head?) and a purpleish blazer. It doesn't look purple at all in the photo - should have used the flash! Which skirt remix do you prefer? I really love the first one. 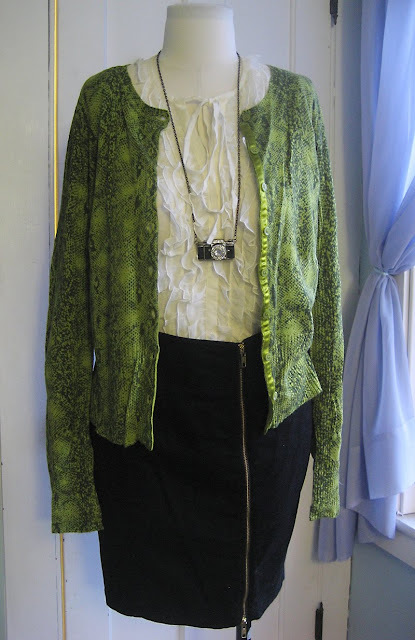 The entire outfit is black and white and then there's a bright pop of that pretty patterned green cardigan-- so fun! Of course, they're all pretty! i love the first one too. the bright top is so refreshing. and it has a lot of texture. i love your camera necklace, it's so cool! Cute! I think my favorite has to be number 2 - it looks stylish and comfy! I love the second one - mixing the sweetness of the ruffles with the sassy exposed zipper is great! i love the 3rd look! the blazer adds perfect structure to the pretty, printed ruffle top! the second is great as well - it looks comfy! im loving your outfit choices here! I love the first choice. To make it better though, I would choose a different cardigan! Lovely! Loving the green snake cardi combo! Hope you are feeling better today! Such a fun post. I fell in love with the first necklace, how cute is that little camera! !